This is a pretty cool video clip. 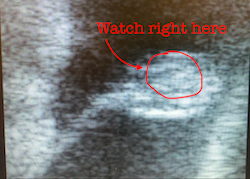 Do you remember that in the blog where I announced that I was going to adopt from Last Chance Corral, I also showed a photo of the ultrasound confirming that our mare was in foal? This is the same mare. This short video is from today’s 28 day pregnancy check. This time the vet was looking for a heartbeat…and we got one! You might have to watch the video a couple of times to see the movement. Don’t worry, at one point in the video I also circle the spot you should be focused on. I agree that there is an unwanted horse problem. I agree that more knowledge, education and homes are needed. I try to help the industry by addressing these subjects both publicly and privately. My husband and I also enjoy training high level performance horses. As part of that we choose to participate in breeding with the goal of improving the breed. We keep some of our horses and we sell some of our horses but people are always told to contact us if they need to sell. We are invested in these horses and often follow their ownership and career for the horses entire life even if they don’t stay with us. The short story is; I think I can do both. Help horses in need and improve the breed. I would like to ask the individual who commented on your breeding program if they have children. There’s a huge over population problem and many unwanted children living in neglectful or abusive homes. Does that mean no one should have their own children? Thanks for being a responsible breeder! To combat equine overpopulation, we need more education, ethical breeders, & harsher penalties for abuse/neglect. I agree with you. If those breeding quality horses stopped breeding, we would just end up with the subpar ones that end up at slaughter. Instead of castigating someone known for not only breeding and training quality horses, but also rescuing unwanted ones, they should work on educating those “backyard breeders” breeding subpar horses to dump for a quick buck. I think you are a asset to the horse world! You not only are a responsible breeder of high level performance horses but you also are helping home orphan foals that will likely trained by you to be performance horses in their own right. Well done for all that you do for the horse world! This is a tough issue. I’ve seen so many horses over the years sold at low end auctions for no reason of their own. I’ve seen a 5,000 dollar foal sold to a kill buyer by the time she was a year old. She went through three different owners who didn’t want to invest time into her. Breeding good quality foals does not guarantee a good useful life. I have a mare I love!! She is beautiful. I’d like nothing more than to breed her. I’ve been looking at stallions for years. The foal would be mine. Not sold, I’d be so proud to ride the horse I know I could have if I breed her. I’ve even had several veterinarians tell me she should be bread because she is such a nice horse. I have not done it yet. But maybe someday I will, doubtful but possible. It’s a tough call, I think if you are only breeding one or two? No matter how you look at it there are too many horses being bred. A few months ago I saw about 20 gaited yearlings in the kill pen. Who breeds 20 and send them to auction. I think the solution is three fold. Responsibility, education, and I’d like to see more regulation. I’d also like to see microchips making the breeder responsible if the horse should end up in an auction. That’s a very unpopular stance! Most think the current owner should be responsible. And they should! but the person who knowingly brings life into the world should bear the brunt of that responsibility. I agree. I was happy when the AQHA started the Full Circle program https://www.aqha.com/membership/resources/advocacy/full-circle/ . The issue, I think, still comes back to education too though. We had a man tell us once that he sold a bunch of yearlings and his words were, “But I pulled the papers so they aren’t considered registered.” WHY? He only hurt the horses by pulling the papers. I guess his name would have been on them but really…he only hurt the horses. Crazy thinking hurts horses. I agree. I also think people don’t want to invest the time (or money) into good training of horses. I agree and also investing time (or money) into good training of horses. You are adopting two goals that were thrown away. You’re not part of the problem. I applaud your follow through after horses leave your facility. It all breeders were as responsible as you are, then we wouldn’t have a horse overpopulation. There is an offer population of horses, no doubt. However if we still being quality horses the people who just breed for the heck out it will be the only ones putting out foals and those will not be worth doing much more than hacking down a light trail with. We need to keep being for higher quality, fabulous foals and teach those that breed because foals are so cute that they are the reason that horses are not doing well in the USA. Perfect answer. 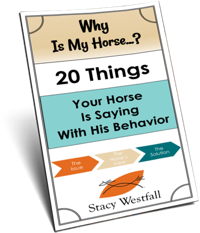 All horse owners should be as responsible, thoughtful and giving. Absolutely spot on. However, is humane slaughter truly a bad market to have? Canada and Mexican plants are highly regulated by European companies, of which they use the meat rightfully for consumption. I get how it seems barbaric to one who thinks of their dream performance horse having such an ending to its life, but since when did horses truly stop being livestock? Years and years ago, horsemeat was in dogfood. It was kind of a joke, saying, “Well that one might be dogfood if he doesn’t shape up!” It may still be in dogfood…..”meat byproducts”? Ouch Andrea. that one hurt!!! Sounds like something that would have been said (written) 20 or 30 years ago. There is just a ton of research and information about these issues and the change of heart in recent years with our equine friends that have carried us on their backs and done so much for us for centuries, really. Andrea, apparently you haven’t seen the horror stories about what happens to the poor horses sent to slaughter, especially in Mexico. Horses only stunned and not dead, being hauled up by their legs and skinned alive! I could go on and on about the barbaric things that are done to these poor animals. The auctions are filled with quality horses with good bloodlines of all breeds, as well as the used up and broken down who are no longer useful to their owners, who are trying to squeeze the last dollar out of those poor animals. No real horse lover should EVER be in favor of horse slaughter-anywhere! Also, if you have a “dream performance horse” who has worked his heart out for you, don’t you owe it to him to give him a good life, and a good and humane end of life?! I guess in Andrea’s world it doesn’t matter-they’re just “livestock,” no big deal!!! You are absolutely right. I’ve rescued many horses over the years, and proud to do so. I’ve also bred some really fine mares and raised some really nice, well bred babies. In fact, yesterday, a friend who bought one of our babies sent me a pic of her. She’s over twenty now. I believe in doing what I can when I can, but I’m certainly not entertaining anyone throwing some guilt card out there and trying to make me responsible for all the irresponsible animal owners out there. You wanna lecture somebody, lecture them! Like my daughter, who is a Veternarian in Orlando says, you cannot save them all. You just always try to do the right thing. 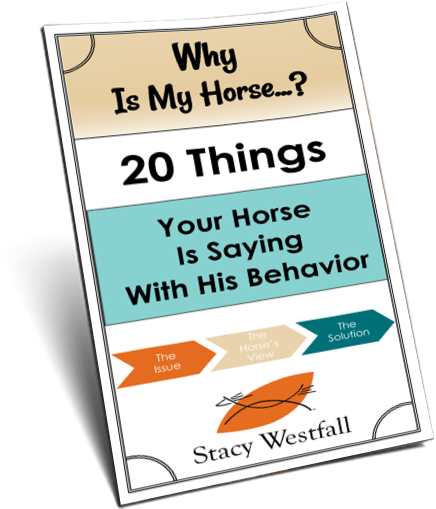 Stacy Westfall is completely responsible with a heart planted firmly where it should be. Suggest that person go find some of the owners of the mares that produced the Last Chance foals and the Bella Run Equine Rescue horses dumped at the kill sell And go get em! We also keep in touch with many horses that have not been bred by us, but that did go through our barn. I love getting the updates from horses we trained 15-20 years ago! Trust me, the plight of unwanted horses (and dogs and cats and guinea pigs) is something I care VERY deeply about. But it always bothers me when people call out/shame responsible breeding. We would no longer have Quarter Horses, or Friesians or Tennessee Walking Horses (or German Shepherds or Scottish Folds – sorry, I don’t know any guinea pig breeds) if we no longer had responsible breeders. And the argument that there are unwanted horses (dogs, cats etc…) out there so you should not be breeding is like saying there are so many kids in foster care, orphanages and other miserable situations, that you should never consider becoming pregnant. There is room for both. Both (done responsibly) are noble and wonderful. I personally have one rescue dog and one dog from a breeder. Both my horses were bought from personal sales so no rescues there but I do follow, share and contribute to several rescue organizations. And shame on anyone who tries to shame either responsibly made decision. Oh my goodness…i believe you are correct and are capable of doing both. Just as responsible parents are always invested in our children I believe its a responsibility issue when it comes to each of us in how we make a difference with our own horses. We cannot fix how others care for their animals but we can do something about our own. Therein lies the issue. Horse owners need to be very responsible for their horses and not let their choices they make put them in these predicaments. As in the constant horse trading and shuffling around of them. Just something to think about. I don’t have ANY problem with responsible breeders. We breed too and try to follow the colts we sell through their life. There is a problem with too many horses but it stems from people breeding for the wrong reasons or no reason at all. We get our horses and dogs from responsible breeders. I, like many people, like to know where my animals come from and something about their breeding and bloodline before I purchase.